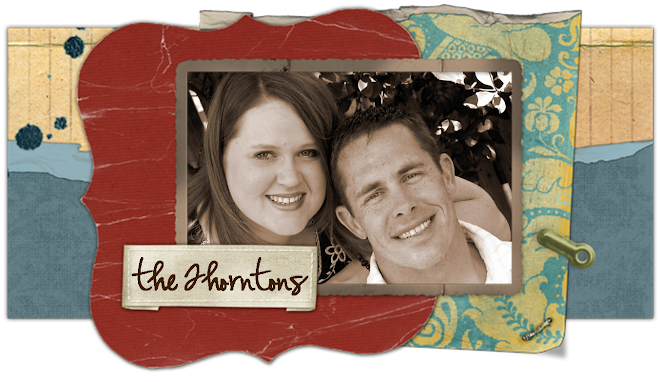 the thorntons: New House...New Camera? So far we've laid wood laminate in 2 rooms, changed out all of the baseboards in the living areas, painted 5 rooms, installed a new fridge & dishwasher, and done lots of tedious "fixing" that needed to be done. Next step is putting in new lights in the entry, dining, and kitchen. After that, I'm afraid I'm going to be "cut off" before I can get new countertops. Until then it'll just have to be a work in progress. We really love being in a house again though, and it's great to be so close to everyone! Ryan hasn't gotten to enjoy it much because he's been out of town Monday thru Friday 3 weeks in a row. His new job is just about as crazy as the military was as far as travel goes. At least he's SAFER than in the Marine Corps days, so I can't really complain. OK, I'm off to justify buying a new camera! The house looks great! And wow, you were on the ball at getting things done! I'm impressed! I love it! Y'all have done a great job!!! So homey...anyway, send me an email ... I lost your email address when I lost my school email! ... I had so much fun yesterday! LOVE YOU! The house looks great!! I love the colors you have chosen :) I can't wait to see more. OH Shoot! I can't believe your camera broke!!!!!!! Thanks for the few pictures! It looks awesome! I can't wait to come see it!!! Your house is lovely! You are so cute and on top of things! Teach me please! I am impressed! The house looks so great & I love the colors. Can I just say that we have been trying to paint our entire house & we only have 1 tiny bathroom finished...you are my HERO! Now anytime I think I don't want to paint - I will look at your pictures to motivate me! Love it! OMG ! It is so cute! I love it! I can't wait to see it in person! I'll have to come soon! It looks so great! I'm so ashamed of myself b/c I've been in our new house for over a month now, and still nothing hangs on the walls. You go, girl! WOW. We've been in our house for almost 2 YEARS now, and I've only managed to paint one lame-o wall... I'm so impressed! I love the style and the colors you chose!! It really does look great! Ahhh, your house looks SO GOOD!! You did a great job painting and decorating...I love it!